This pencil holder project is easy, but you should assist younger kids since aluminum cans may have rough or sharp edges. Also, please give thought to the choices for embellishments since they are of swallowing size. In preparation, have some ideas as to favorite colors, themes, sports, animals and pastimes the dads enjoy with their kids. If this is a child over the age of four years, they might not want any assistance and they could come up with the ideas all on their own. Have fun making these Father’s Day crafts for kids! Optional: Stencils, stickers, foam cutouts, chenille stems, corrugated paper, scrapbook embellishments, chenille stems, beads, etc. Step 1: Make sure your soup can is clean and dry. Sand any rough, jagged edges. Step 2: After picking the base color to wrap around the can, size the paper to the can and then cut it to fit. Step 3: Apply glue to the surface of the can, making sure to cover evenly. Wrap the base paper around and smooth out any bumps. Step 4: Children may also paint the can with an acrylic paint. Tempera paint is not advisable, as it will peel off. Step 5: Adhere a spring-type clothespin (unfinished or painted) to the front as the beak. Step 6: Think of ways to add eyes. Craft store googly eyes are cute or make them from construction paper and glue onto the can. Step 7: Remember to get the children’s original handiwork in there, too. Have them draw note cards to attach inside the beaks. 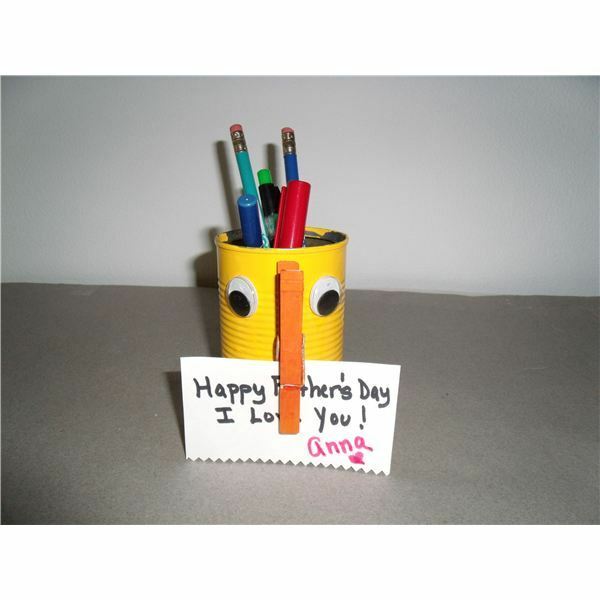 This clamp is what makes this pencil caddy unique as the owner can attach important messages to the front, although Dad may wish to keep his child’s special card there. ***Don’t forget to add some new pens and pencils! Sports Enthusiast Dad: Craft stores have a multitude of shapes for sports: foamies, stickers, etc. Have the child write a cute saying on a team pennant, such as, “Dad is #1,” “Team Dad,” “Top Scoring Dad,” “We are Your Biggest Fans,” etc. Fisherman Dad: Obviously, fish shapes and water would be a good idea, but how about a fishing rod? Use a small stick and glue it to the can with a piece of string. Have the child draw a hook with a fish at the end. Have any of those plastic nets used to hold onions or oranges left over? Use a small piece of netting to hold a few fish. Musical Dad: Dad loves music, so make him a “playlist” of made up songs written on the outside of the can that only his child can personalize. Don’t forget the artwork. Artistic Dad: Dad is artsy, so cut some construction paper into bits and make your own mosaic. To make it look more authentic, use a base color and when gluing the shapes, make sure there are tiny cracks between. If you forgot to leave spaces in between, use puffy paint (fabric paint in tubes) to create the grout lines. Foodie Dad: Dad loves to cook or eat. Food shapes are all the rage, so finding shapes won’t be impossible. Alternatively, try using some actual food, such as dried pasta or rice and have the child draw a bowl or plate onto the can with the pasta in it. Don’t forget the fork! The Pencil-Pushing Dad: A supply of pencils, all one color or varied in color and unsharpened is needed and lots of glue. Take each individual pencil and attach them all around the can with eraser side up. This one will take a bit of patience since the glue, preferably very tacky, will need time to stick. Tie a string or ribbon around for extra security but also as a finishing touch. Using these Father’s Day craft ideas is sure to produce a lovely homemade gift that the dads will cherish and the children will love to present on this special day.